Odhran MacNiallais during the 2018 Allianz Football League. DESPITE HOPES THAT he would rejoin the Donegal squad ahead of the championship, Odhran MacNiallais has confirmed he won’t be involved with Declan Bonner’s side this season. 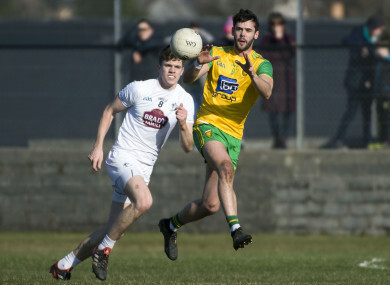 MacNiallais played a starring role in Gaoth Dobhair’s run to the All-Ireland club semi-finals and his decision not to commit is a major blow to Bonner’s plans as Donegal look to build on their Division 2 success. “No, I’m not going back,” MacNiallais told the Donegal Democrat. “I spoke to Declan last week and told him I’m not going to play this year. “I just have no real interest in football at the minute to be honest. The last few weeks, even training with the club, I haven’t really enjoyed it. “I just don’t have the hunger or desire to give the commitment to Donegal. I explained that to Declan last week and he was very good about it. His clubmate Mícheál Roarty was one of four young men who died in a Donegal road accident in January, a tragedy that MacNiallais is still coming to terms with. “It’s still tough. You wake up every morning and it’s still hard to believe it happened. It puts life into perspective. “Growing up football was everything to me and that’s fading away a bit now. “It’s hard to explain but I just don’t have the enjoyment and desire to play football. Football in the last few years is not as enjoyable as it used to be with the way that it’s played and that’s part of it too. The 26-year-old was nominated for an All-Star after a stunning debut campaign in 2014 and earlier this month was named at midfield on the AIB Club Team of the Year. Email “MacNiallais: 'I'm not going back. I just have no real interest in football at the minute'”. Feedback on “MacNiallais: 'I'm not going back. I just have no real interest in football at the minute'”.